Will veal catch on with British meat-eaters? Veal – it’s a controversial meat, marred by animal welfare issues. But if it was sourced ethically from British suppliers and sold in supermarkets, would you put it on your menu? That’s what Jimmy Doherty wants. After several animal welfare organisations raised awareness of the inhumane production of veal, where calves were kept in confined crates and exported live to the continent, veal sales nose-dived in the UK. Now veal only makes up 0.1% of the meat we eat in Britain. Veal crates were banned in the UK in the 1990s and a Europe-wide ban followed in 2007. Still, veal sales have never recovered and you’ll find it tough to track it down in the shops. And although Tesco imports German veal, British veal is off the menu – until early next year. Tesco will begin to stock British ‘rose veal’ from 2013. Why rose veal? Well, because it’s pinker than the pale meat you might find on the continent, where calves are fed a restricted milk diet. In some ways, eating rose veal could be more ethical than not. It all comes down to where the calves come from – they are somewhat a by-product of the dairy industry. 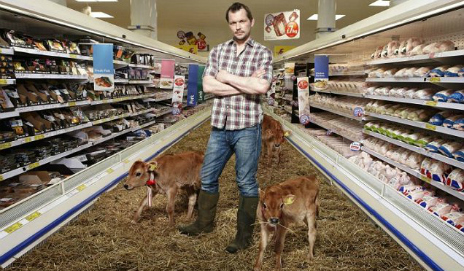 Jimmy Doherty, who promotes rose veal in tonight’s episode of his Channel 4 show Giant Supermarket, is trying to expose the ‘hidden scandal’ of male dairy calves being shot. You see, our love of milk and cheese comes with the uncomfortable truth that dairy cows are kept constantly pregnant. And while female calves grow up to become milk providers just like their mothers, male calves (if they’re not good for beef) are often killed straight after birth. The most ethical answer to this problem is simply not to eat dairy products. However, it’s unlikely that a nation of meat-eaters will make the switch. Instead, as Jimmy and campaigning groups suggest, we could prevent thousands of male calves being shot and promote veal as a viable meat. As for me, I’m known for eating almost anything (unless it’s mayonnaise), so I haven’t consciously steered away from veal. However, I would never have gone on a mission to find it in my local supermarket. Like foie gras, it’s not a product I’m totally comfortable with. But after reading about how rose veal is pretty high in the welfare ‘steaks’, I might look out for it next year. So, will veal make it on to your shopping list? I’m getting very tired (*adjusts language*) of the way the meat industry throw around phrases like ‘ethical’ and ‘higher welfare’, when there is nothing ethical or high-welfare about forcing animals into pregnancy year after year, then stealing their calves at birth, and killing them a few months later. The promoters of rose veal simply know that if they can convince the general public that this ‘product’ is ethical, the’ll make more money. Ask anyone who actually believes in ethics and animal welfare and they’ll probably argue that the most high welfare thing you could do for these calves is take them out of their misery at birth. I really think our grandchildren will look back at the way we treat animals today in utter disgust. Regarding the waste issue, if you’re concerned about food wastage, you might want to consider the fact that around half of the worlds crop and water resources are consumed by farm animals to produce meat, and a lot of these crops consist of soy that is grown on felled rainforests (as opposed to vegan soy products which are generally G.M free and ethically sourced (but actually ‘ethically’ sourced in this case). The entire meat industry is as wasteful as it is cruel, and it’s time for change. It will catch on but at present its quite expensive even at cut-price Aldi until its sold at a reasonable price especially with times being hard for the greater majority it will not. I have always been concerned with ethical foods and veal being delicious as well as controversial is no different. If I was going to buy some veal I would like to know exactly where it came from. These guys seem to have a good process http://www.cotswoldveal.co.uk when it comes to raising the calves and the type of meat they produce.